The fourth truism derived from former Defense Secretary Donald Rumsfeld’s syllogistic philosophy of foreign policy in Iraq, the “Unknown Known” may be another name for imperviousness, or disavowed belief. If what we don’t know can hurt us, it is what we are unaware of not knowing—the Unknown Unknown—that can terrorize us, brought about by a failure of imagination, according to Rumsfeld. If “Rummy” sought to obviate the potential harms exacted upon US citizens at home and military personnel abroad in the “war on terror” through a policy predicated on such rhetoric, it is documentarian Morris’ agenda to tease out the consequences of willed ignorance that Rumsfeld’s semantic excursions both disguised and betrayed. 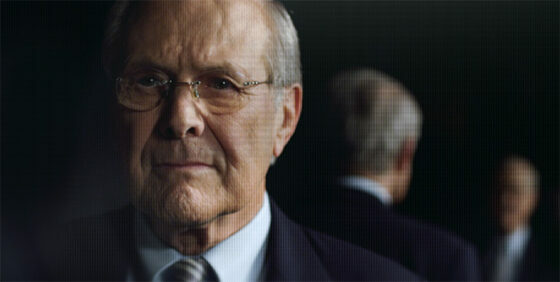 Granted unprecedented access to the resigned politician (whose candour perhaps owes something to his graceless exit from office), Morris interviewed Rumsfeld for 33 hours in a cordial attempt to entrap the unwary pundit through a kind of psychoanalytic mirroring technique, in which Rumsfeld’s blizzard of internal memos (“snowflakes,” as he called them) is invoked like a trail of breadcrumbs to be retroactively savoured on his road to victory—only the road led, as we know, to moral perdition. Morris is intent on showing Rumsfeld an image of his own damnation, and to that end the unseen interlocutor is direct yet surprisingly non-confrontational. But the mirror that Morris holds up, as if for the audience’s delectation, is smeared by a visual and aural schema—kitschy graphics and an overbearing Danny Elfman score—that only obfuscates the devastation of Rumsfeld’s unaccountability. In this regard, The Unknown Known skews closer to Tabloid than The Fog of War, a distinction that is less flattering of Morris than it is condemning of Rumsfeld. Still, as a history lesson in digest form, it’s eminently valuable for cracking Rumsfeld’s cheshire grin without employing unsound interrogation methods.